Canadian Black Bear hunting trips are our specialty! 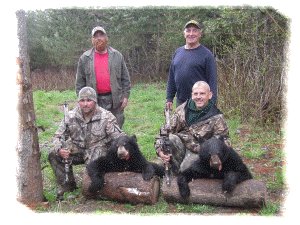 As the premier Black Bear hunting outfitters in New Brunswick, Canada, we conduct our spring and fall hunts within a 40+ square mile area in north-central New Brunswick in which no other outfitters or guides are active. This works out to about 26,000 acres available to you and your hunting party. Our bear hunts are done in the evenings over bait using both ground and tree stands, on average we employ 2 bait locations per hunter per week. New bait sites are used each week for every group of hunters to insure these locations are not over-worked; this strategy helped us achieve an 88% success rate from 2010 through 2016. For 2017 Spring black bear season in New Brunswick will open Mid-April and run through until June 24. Our bear hunts start around the second week in May. Firearms or bows may be used during this time, also, crossbow hunting in New Brunswick is now legal during any open season for bears*. Crossbows are gaining increased popularity with our clientele. What's included in our bear hunting packages: All preseason scouting and baiting, lodging, meals, transportation to/from hunting areas, guide fees plus all skinning, processing and preparation for your taxidermist. A second bear license may be purchased on the spot, so if you should harvest a bear early in the week and wish to continue hunting we can provide this. Additional fees in addition to the license cost apply- contact us for more details. Combination trips are available where seasons overlap (fall bear and whitetail deer and/ or ruffed grouse hunting for example) also many of our guests take advantage of the fine fishing in this area during May and June. The Tobique river is literally in our back yard and features great fishing for Brook Trout and Landlocked Atlantic (Sebago) Salmon; other fishing opportunities are also possible, more information on fishing, as well a complete summary of season dates for all animal and fish species can be viewed on our "general information" page on this site. There you can also find more information that covers most the frequently asked questions; what to bring, what weather to expect etc, to fully prepare you for black bear hunting in New Brunswick, Canada. New Brunswick Record Book Bear 2015-A Tribute to a Special Friend and Guest. May 26, 2015 is a date that will go down the history of Haley Brook Camps as the date that one of the most memorable and special events in our twenty five plus years of outfitting took place. 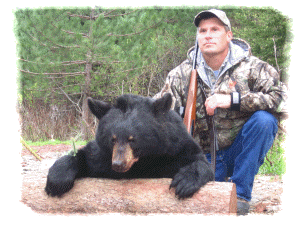 On that date one of our hunters, Mr. John Mellinger took a huge bear. In our many years as outfitters we've seen a lot of big bears however the circumstances surrounding this particular event made it one none of us will ever forget. Mr. Mellinger, a veteran of two tours in Viet Nam, showed incredible courage and determination not just to be in the stand that day, but just to make the trek from his West Virginia home to our camps here in New Brunswick. About a year prior to this day Mr. Mellinger was diagnosed with ALS. In spite of the difficulties his condition presented he elected to go through with hunt they had booked when they were here in 2014. He was accompanied here this year by his son Ross and two of Ross' friends, Paul and Jeremy. Being aware of his condition, weeks before his arrival, we constructed a special stand for Mr. Mellinger, in an area not too far from a road. His son Ross and his guide David assisted him in getting and out of the stand. On the second night of the hunt Ross and David went to pick him up. Barely able to speak, he motioned toward the barrel. Darkness had set in and Ross and David went to investigate... He had indeed shot a bear and what a bear it was. Upon return to camp the bear was weighed. The dressed weight was 430 pounds meaning Mr. Mellinger's bear weighed well in excess of 500 pounds live weight. Initially the skull measured 20 7/8 (green) with a final dry score of 19 6/16. On behalf of Frank, Gail, David, Karenna and everyone associated with Haley Brook Camps we salute Mr. Mellinger not just for his exceptional bear, but for his truly inspiring determination and courage. We thank him for creating and allowing us to share in this special event. It's the moments in time like this that are the real payback for us as an outfitter, beyond the dollars and cents this is the true reason we do what we do. Once again we compliment Mr. Mellinger for always being a genuine gentlemen and we are privileged to call you a friend. I’ve been on both spring bear and ruffed grouse hunts at Haley Brook Camps and can’t wait to go back again. Frank and David work very hard and put you on active bait sites far from camp where you won’t be disturbed. They spend the time and put the miles on the trucks to make sure of that and you will see bears. I was equally impressed with the grouse hunt. They know where to find the birds and we killed a pile of them. All the meals served are excellent as well. They make sure to take great care of their hunters. If that isn’t enough, many laughs will be had and they are all just great people. You come as a client and leave as a friend. I have had the pleasure of hunting at Haley Brook Camp for two consecutive years and harvested great bears both years! As an international bowhunter, I especially appreciated how baits are placed perfectly for close range bowhunting with great logistics and safety considerations! At camp, accommodations and food are awesome and this family operation is both friendly and efficient! I stand by my words. I am returning again this year! To read more testimonials from our previous clients be sure to visit our testimonials page .